Is AyaNova right for my company? "I just want to say, "Thank you." Not only has AyaNova developed a robust product, with thorough documentation and wonderful support, but is staffed by great people, like you, willing to go the extra mile to support their customers. You can count on us to boast about AyaNova to everyone we meet!" What limitations are in the trial AyaNova? When you install your AyaNova setup file that you downloaded, our AyaNova program files and its database (with trial data and 45 day limitation) will be installed, the database will be unregistered with all features licensed and unlocked so that you can fully trial all. Is onsite training needed to be able to use AyaNova? Nope! AyaNova is very easy to use. Unlike other service management programs that easily charge you thousands of dollars to provide training, expensive onsite training is not required nor needed with AyaNova service management software. What is recommended is to follow along with the AyaNova Online Help tutorials of many common tasks that you would perform in the How do I..? 's, as well as detailed information on every feature of AyaNova. Also check out the third party companies and consultants that have posted their AyaNova service management software related services on our AyaNova Support Forum. Can I delete the sample data that is in my trial AyaNova? Yes! You can erase the sample data in the AyaNova database if it is licensed - whether trialing or once you have applied your purchased key. Follow the easy instructions in the AyaNova Help section "How do I erase the AyaNova database?" by using the quick menu option to erase your AyaNova database. Also identified in that tutorial is what aspects that are not deleted such as the AyaNova Administrator user account and report templates for ease of starting fresh with AyaNova service management software. Will data I enter while trialing AyaNova still be there after I purchase? Yes! When you purchase your AyaNova full service management software subscription license(s), you will receive an Activation Key via email with instructions to fetch and apply your Key to your AyaNova database that you have already installed and fully trialed to ensure it meets your needs. Any data you entered while you were trialing will still continue to be available after you fetch and applied your Activation Key to unlock your AyaNova database for the subscription license level you purchased. The AyaNova desktop program is compatible with both 32 bit and 64 bit. Linux, Mac, laptops, tablets and mobiles as well as Windows desktops can also access your AyaNova data using a web browser via one or more of our remote access options. 1GHz or higher Pentium-compatible CPU with 500MB RAM or higher. AyaNova is hardware scaleable - performance is directly related to the performance of the computer in use. Obviously a faster computer is going to be able to respond more quickly. Your "server"'s minimum hardware requirements 1GHz or higher Pentium-compatible CPU with 500MB RAM or higher. NOTE - "server" is in quotations because your "server" where the AyaNova database is and where your database server software (Firebird, SQL Express or SQL Server) does not have to be an actual server operating system nor does it have to be an actual server hardware. AyaNova is hardware scaleable - performance is directly related to the performance of the server in use. Obviously a faster server is going to be able to respond more quickly. Two aspects to our remote access options: the web application itself, and what the users access via. Remote access users can use any HTML5 compatible web browser as well as any operating system. Can multiple people on my network access the AyaNova data at the same time? Yes! AyaNova was designed so that multiple users can access simultaneously so everyone is always accessing the same live data. Check out more about different configurations possible further down in this FAQ page. When networking AyaNova, should I use the Firebird SQL server or should I use Microsoft SQL Server? Can upgrade Express to Server if needed. Free with a very solid history in production use. Requires little to no administration, once set up it just keeps working. Database can be backed up while running with included utilities. Database files can be backed up without having to have all users out, using gbak utility and Windows task scheduler. Firebird Server is open source free software. For some that is a bonus, others may find that worrisome. We are not normally great proponents of free software for obvious reasons, but we did look at both commercial and open source alternatives to offer with MS-SQL server and it was technically the best match for the requirements of AyaNova. Can AyaNova run on a Mac or on Linux? The AyaNova program itself can not run on a Mac or a Linux machine - the AyaNova program itself is designed for Microsoft operating systems only. However a Mac, Linux or any other OS with a web browser can log in and work in AyaNova using the optional RI remote access interface or the optional WBI remote access interface. And if desired, your "server" where the AyaNova database is hosted for your networked users could be a Linux server using a Linux Firebird Server 2.1.x superserver. You would follow similar setup steps as that for networking AyaNova using Firebird. If any questions, just contact us with your details and we would be happy to make suggestions. What remote access options are available? Log in through any screen sized browser using RI. Log in through a mobile browser using MBI. Check out the Remote Access Options web page for additional details as well as Configurations FAQs below, for an overview of the different configurations possible. Can I use the AyaNova program to connect over the Internet to the AyaNova database without having to use a web browser? Yes! You can connect to the AyaNova database located on another network via your AyaNova Data Portal to run your full AyaNova program on a Windows desktop computer. 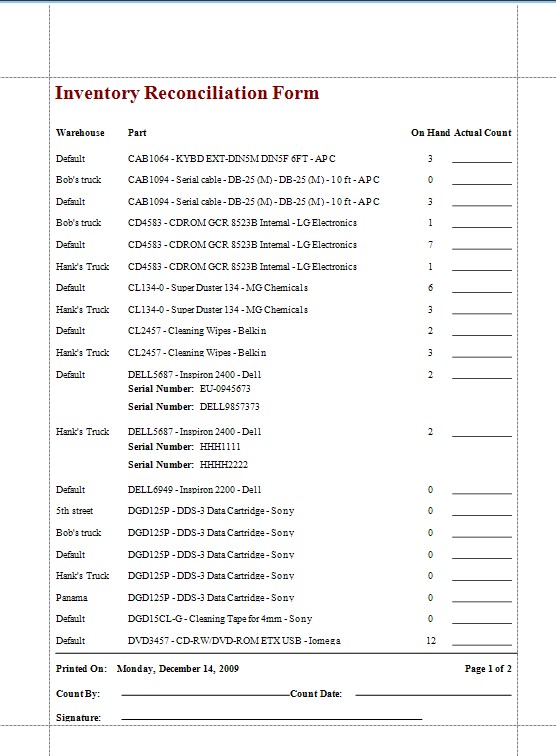 The sample AyaNova database comes with many example report templates that you can use as is or further customize. 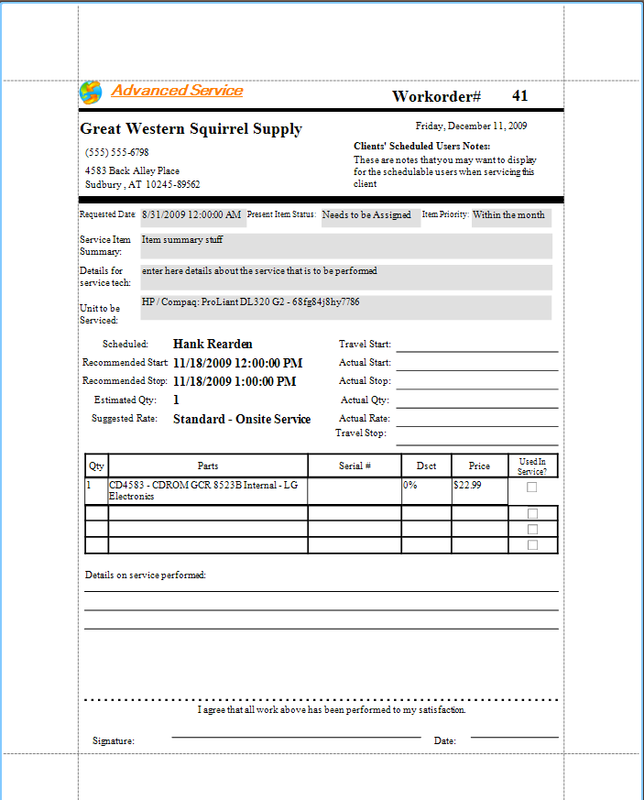 Report templates are not erased when you erase the sample data. 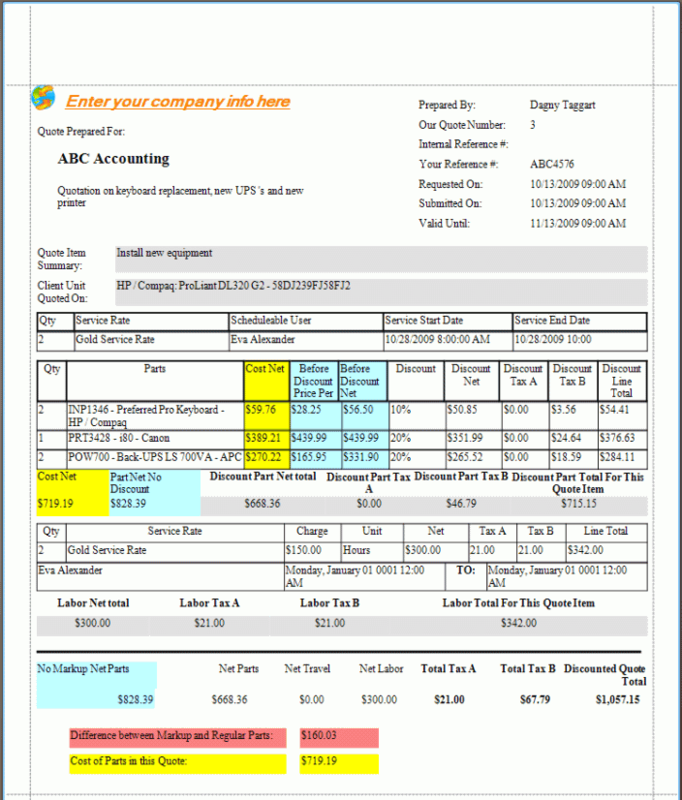 Refer to the AyaNova Online Help for tutorials on customizing existing report templates as well as creating new. And also check out the AyaNova Support Forum for topics about report template design that you can refer to when customizing your own. Can someone host AyaNova for me so I don't have to set it up? What do I do if I have an issue installing and/or configuring AyaNova service management software? Recheck your steps. Most often 99.9% of issues is because a step or two was skipped, and is easily and quickly resolved by checking your steps against that in the appropriate Online Help. Check for solutions to common issues in the Online Help and on the AyaNova Support Forum. Can I develop for AyaNova? Check out the Development / SDK / API section of the AyaNova Support Forum for information on developing for AyaNova - whether it is creating your own custom plug-ins, or creating third party plug-ins that you would sell to other AyaNova users. Also check out the no charge AyaScript utility that you can use to create your own plug-ins that would be accessible directly from within AyaNova. This is the default configuration when you first install AyaNova service management software. Your AyaNova database can not be shared or have multiple computers connect to it when in this configuration. This is the configuration for the full AyaNova service management software when take the default settings. 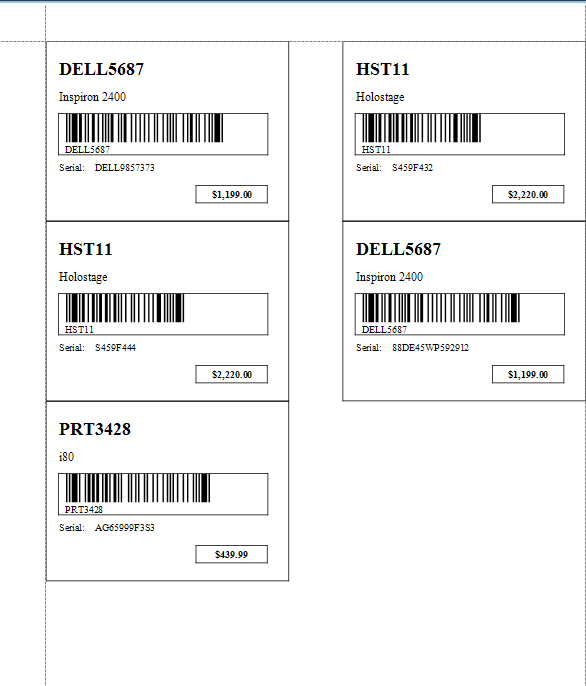 This is the simplest configuration and does not require any other software or special configuration changes to use right away. 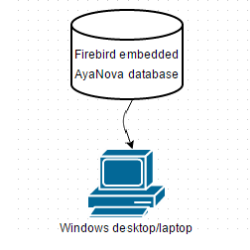 In this configuration AyaNova uses a special Firebird database server called an "embedded" server that is included with the AyaNova program files. The embedded server is limited to one user at a time and the database file must be on a local drive. Step by step default stand-alone steps are also outlined in the AyaNova Online Help. The embedded database file used in this configuration is exactly compatible with the full Firebird database server so it is easy to scale up from a single user to a shared network configuration. 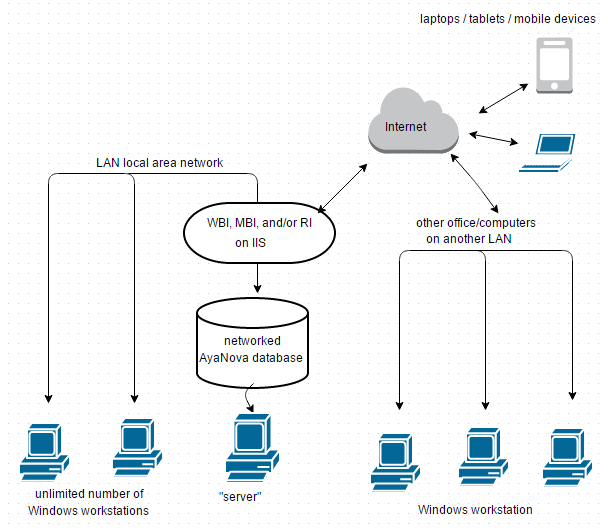 This configuration allows multiple users on the same LAN to access the same AyaNova database simultaneously. A database server is required for this configuration - either the free network Firebird Server, free SQL Express or licensed SQL Server. NOTE - A dedicated database server as shown in the image above is not necessarily required; a workstation could also be running the database server software for smaller networks with few users as AyaNova has been carefully designed to be hardware scaleable. What this means is there is virtually no practical limit to the number of users running AyaNova, the only limiting factor is the speed and capacity of the hardware. In this configuration, AyaNova is networked, plus the "Data Portal" web application is set up so that remote users in branch offices can connect to the AyaNova database via the "Data Portal" while running the full AyaNova program. The purpose of the Data Portal is: security as it can be placed outside a network’s firewall so that the corporate database server is not exposed to the internet; and performance as the data portal connection has been specifically designed with slower connection speeds in mind. The AyaNova data portal is simply a web application that runs on your Microsoft Internet Information Server (IIS) that hosts a portion of the AyaNova program that would normally run on your workstation. This allows a remote user to use the same AyaNova executable program on their remote computer as that used by local users inside the corporate network, continuing to share the same database. We do not mean a web browser; we mean the full AyaNova windows program itself. 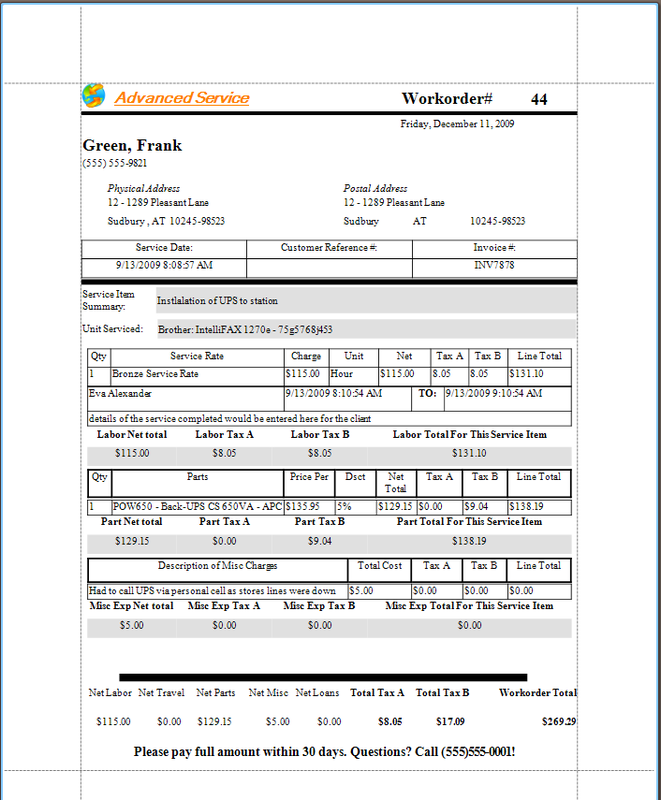 The Data Portal can be set up on a separate computer from the database, or you can have both the database and Data Portal on the same computer. You can also have WBI and MBI web application also set up on this same server. In this configuration, AyaNova is networked, plus one or more of the web browser interface web applications is/are set up so that remote users can access the same live data using just a web browser and internet access. WBI, MBI and RI are simply web applications that runs on your Microsoft Internet Information Server (IIS) to host the web pages that the remote user accesses to connect to the live networked AyaNova database. You can have these web applications on a separate computer from where the database is, or you can have both the database and web application on the same computer. Check out more details about setup and use of each of our browser web applications WBI, MBI and RI. Although AyaNova service management software is very straight-forward for you to set it up for network and remote access within your own internal local area network, you could instead have your AyaNova licensed database hosted for you. In a hosted configuration, your hosting company such as HaveAByte.com will set up your AyaNova database on their server and provide you with remote access through a Data Portal connection, via WBI, via MBI etc. Hosting companies refer to the Hosting Online Help documentation for setup. AyaNova has moved to a subscription model to receive support and updates as of May 2016. 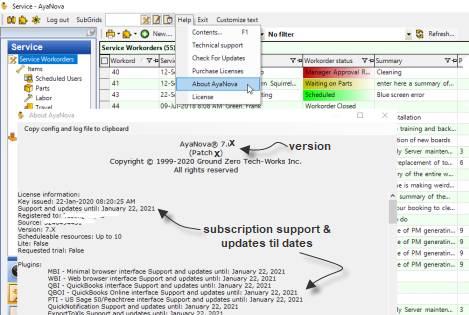 How do I determine if I have the latest version of AyaNova service management software? Select Help -> About AyaNova to display your existing version. Compare YOUR version number to the latest version number available for download. What's involved to upgrade to the latest version? Check your Help -> License for the expiry date of your subscription(s). If you do not have a subscription or if your subscription has expired, purchase a subscription that is equal to the number of scheduleable resources your database is presently licensed for, and subscriptions for any options you presently use and will use. Review the upgrade steps for your configuration in the AyaNova Help documentation (i.e. if configured for SQL Express use, you would follow the upgrade steps with the title "Updating if networked SQL Express AyaNova"), confirming requirements and steps. When payment has been processed and your Activation Key has been received via email, proceed with the upgrade steps for your configuration of AyaNova. Can I try out the latest AyaNova service management software without affecting my live data? Do so by setting up AyaNova 7 service management software and database separately from your existing live older AyaNova. Since 1999 AyaNova® is a registered trademark of Ground Zero Tech-Works Inc. in the United States and other countries.